Steve Reed MP has criticised Croydon’s two Tory MPs after they backed plans to CUT £44m from Croydon but send £24m to Surrey – a county which is far wealthier. After complaints that Government funding cuts were too severe, the Government announced a £300m ‘relief fund’ to help affected areas. But instead of targeting the money on areas with the biggest cuts, 85% of it has been sent to areas with the lowest levels of deprivation that have experienced the least cuts. Most of these areas are run by Conservative councils, and there are concerns the public money was used as part of a political fix to buy votes for the Tories in the run-up to council elections in May. Croydon gets £800,000 – but that still leaves the borough facing £44m cuts that will devastate local services such as street cleaning, filling in pot holes, caring for older and disabled people, or looking after our parks. Croydon North’s Labour MP Steve Reed voted against the proposals, but the borough’s two Tory MPs voted in favour. “The Government announced a £300m fund to help ease the pain of the cuts, but instead of giving it to areas that have had the biggest cuts, they gave it to wealthier areas run by Conservative councils that have had the least cuts since 2010. 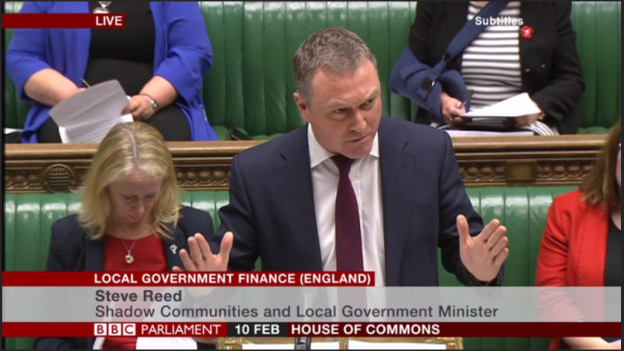 You can see Steve’s response to the debate on local government finance below.